The fishing boat Alley Cat aground on rocks. Photo: NSRI Port Elizabeth. 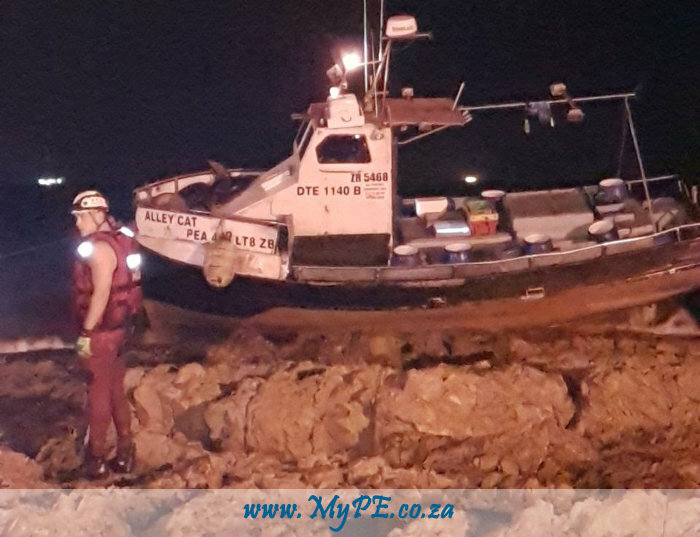 At 01h51, Sunday, 11th February, NSRI Port Elizabeth duty crew were activated following eye-witness reports of a fishing boat run aground at Main Beach, Port Elizabeth, by Hobie Beach. The sea rescue craft Spirit of Surfski IV was launched and NSRI crew responded directly to the scene. The SA Police Services, a Police Dive Unit, and EC Government Health EMS responded. On arrival on the scene the 12 meter fishing boat Alley Cat was found washed ashore along the shoreline and the 9 crew were safe. Casualty crew were walking ashore and only the skipper remained onboard. NSRI crew assisted to remove fuel, any contaminants and equipment and the owners and crew assisted with the removal of crews personal items and equipment from the fishing boat. EMS paramedics medically checked the casualty crew and no injuries were found. The cause of the fishing boat running aground has not been determined. At high tide on Sunday the owners will attempt to re-float the casualty fishing boat. NSRI Port Elizabeth will be on the scene to stand-by during the attempts to re-float the casualty boat. SAMSA (South African Maritime Safety Authority) are investigating.